Reginald Gale was born in Yeovil in 1897, the son of joiner/carpenter Frederick Herbert Gale (1863-1934), originally from Bridport, Dorset, and Maria Ann née Hawkins (b 1866) of Yeovil. In the 1901 census Maria, listed as a leather glover, was living in newly built 1 The Avenue, (no sign of Frederick at this time) with her children; Bessie born 1890, Alice born 1893, Ernest born 1895, Reginald born 1897, Leslie born 1899 and four-month-old Ivy. By the time of the 1911 census Frederick and Maria were living at 47a Queen Street. They now had a new son Clifford aged eight. Reginald, by now aged 14, gave his occupation as 'Wash House Lad' and was, presumably, working at the Corporation Baths in Huish, just around the corner from his home. 17-year old Reginald enlisted in the Regular Army in September 1914 as Private Gale (Service No 15557) in the 1st Battalion, Somerset Light Infantry. At the outbreak of war in 1914 the 1st Battalion was in Colchester, with 11th Brigade, 4th Division. The Battalion landed at Le Havre, France with the British Expeditionary Force (BEF) on 22 August 1914, in time to fight in the battle of Le Cateau during the retreat from Mons. The 1st Battalion, Somerset Light Infantry remained on the Western Front with 4th Division, throughout the war. After his basic training Reginald would have joined his Battalion at the Front, probably towards the end of 1914. 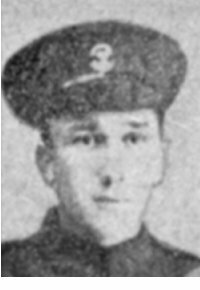 Reginald Gale was reportedly shot and killed by a sniper on 30 July 1916, not in a set battle but in the day-to-day horrors of trench warfare. However he may not have been killed immediately as reported, since he was buried in a cemetery associated with a Dressing Station, intimating that he died from his wound. 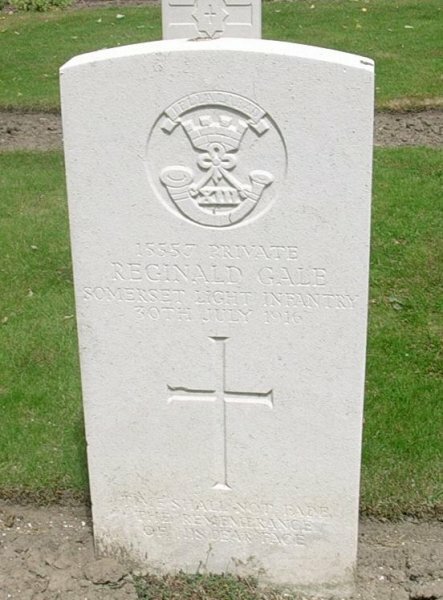 Reginald Gale was interred in Essex Farm Cemetery, Leper, West-Vlaanderen, Belgium, Grave III.A.7, and his name is recorded on the War Memorial in the Borough. 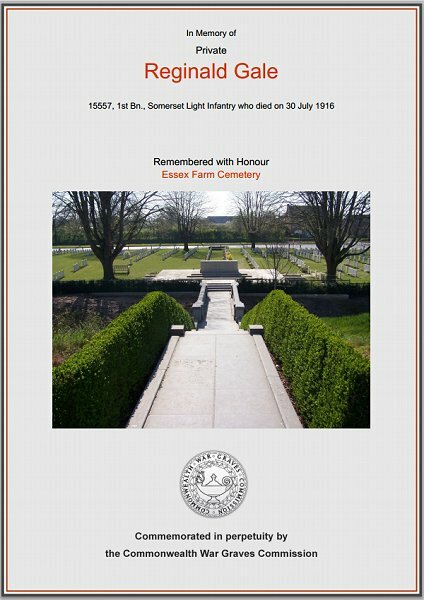 The Commonwealth War Graves Commission certificate in memory of Reginald Gale.